Magnification and illumination in a credit card format; the ideal size for any pocket. Provides a brilliant image with optional illumination when you slide the lens out of its case. Ultra-flat and lightweight design; compact case ensures safe storage. Very economical: The light is only switched on when you slide the lens fully out of its case. The LED light does not require changing. 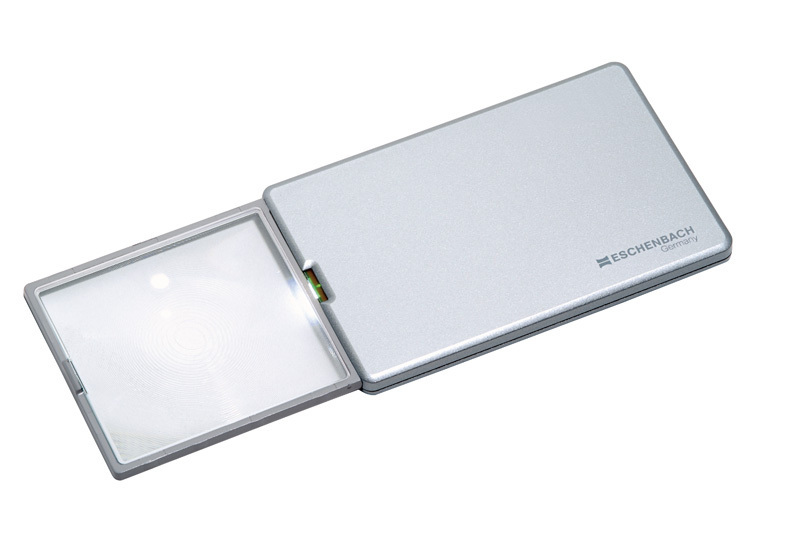 The tiny, extremely bright LED light used by Eschenbach Optik has a service life which is virtually unlimited. 1. Diffractive aspheric PXM® lightweight lens for a distortion-free image with edge-to-edge sharpness. 2. Illumination: ultra-flat SMD LED. 3. Product dimensions: 86 x 54 x 6 mm. 4. Replacement battery: Order No. 15471, requires 2 batteries. 5. Display and Optoform equipement available.